Non-league track Sittingbourne (Iwade) has staged a few meetings this season and that allowed both Richard Hollingsworth and Graham Kelly to capture some snaps of the circuit. Click here to view them. As an added bonus we've also got a couple of pictures of the Sittingbourne Training Track for you to peruse. Ashley Murtough is looking for information on a former rider called Sean Murtough. Doesn't ring any bells with us - get in touch if you remember Sean. Peterborough Panthers are launching a new official website. The address is www.peterboroughspeedway.net. Paul Lambie used to support the Birmingham Brummies. He tells us that John Hart used to wear his wife's nightie under his leathers for luck. Can anyone remember a more bizarre superstition? Action pictures from Sunday's Ashfield Classic. Richard Hollingsworth has been on his travels again. This time he brings us pictures of Brough Park in Newcastle. Dave left the following comments on The County Ground. 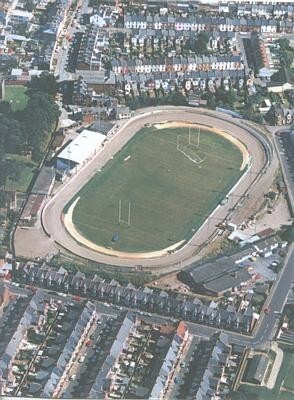 "Exeter's County Ground Stadium and track is unique, one of the very few old 1920's tracks still left. I feel that efforts should be made to keep the County Ground as a sports facility with improvements to the spectator facilities. I'm sure the stadium could be viable if Speedway is kept on a Monday night, reintroducing greyhounds twice a week, Rugby, maybe Football and even a handful of stock car meetings. 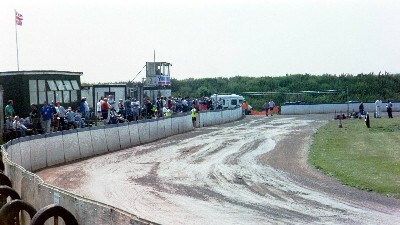 Those who think that stock cars and Speedway don't combine well on the same surface should look at King's Lynn which is one of the best surfaces in the Country even with many stock car events taking place, testament to good equipment and track staff. Step forward a big Stadia group or entrepreneur! " Johh Nethercott supplied the above picture of the County Ground. He's also in the 'A Matter of Opinion' hotseat. Read his views on the Falcons' season and future by clicking here. Middlesbrough fan David Phillips selects his Dream Team. We think that Steph is Seb and Matt's uncle. Young Aussie rider Sam Martin has a new website. Sam is the son of Mark the former Canterbury rider. There's a Newport theme to the site this week. First up is some more of the ever-popular track photographs. Once again we have Richard Hollingsworth to thank for these fine snaps of Hayley Stadium in Newport. This purpose built venue has been the home of the Wasps since Tim Stone reopened the club in 1997. Martin Wilkins has been a Newport fan for many years and his Dream Team reflects this. We always love to receive your Dream or Nightmare teams, these can be submitted through the link to the right. Action pictures from Glasgow Tigers v Somerset Rebels. Action pictures from Armadale Devils v Stoke Spitfires. Thanks to everyone who pointed out that Ljubljana is in Slovenia rather than Sweden as we had stated - it's been fixed. Keep an eye out for the pictures of English circuit Newport that will be added to the site in the near future.